This goalkeeper camp has sold out. Join the Waiting List to be informed if further spaces become available. Thank you! We will send you an email should any spaces open up. World-class goalkeeper camps need the world’s top international goalkeepers and goalkeeper coaches. Our coaching team includes over 100 coaches from more than 20 countries, including World Player of the Year winners, Olympic medallists, World Cup winners and more. + WHAT MAKES EVO SO GREAT? Our camps are coached by the world's top senior players, up and coming junior internationals and some of the best creative coaching talent. Read more about our amazing coaching team. We are trusted & recognised by the international hockey community. 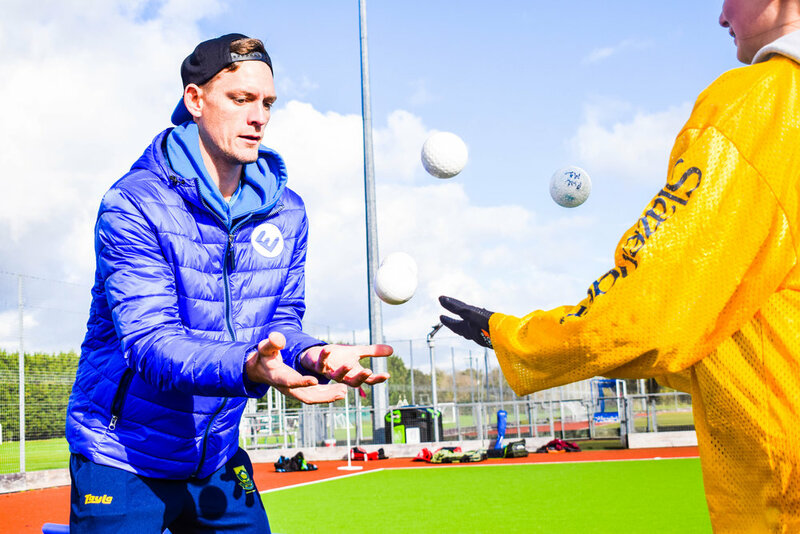 Our camps have been featured by the FIH (hockey's world governing body) and we have been invited to showcase at international hockey events such as the Champions Trophy. We regularly attract the world's best players to coach and young players travel from across the UK and abroad to attend, on recommendation from players and coaches. Our camps are tailored to the players attending. You provide your playing information on registration and we make sure that, whatever your level, the programme you are on is optimised for you. In this way we have successfully developed players, from complete beginner to junior international level. Our camps are creative, innovative and fun. We show young players hockey styles, philosophies and ideas from around the world, inspiring them to learn new skills and think about hockey in different ways. Sport psychology, strength & conditioning, video work and more are used to ensure maximum development benefit and enjoyment for all players. + WHY SHOULD WE TRUST YOU WITH OUR YOUNG PLAYERS? At EVO Hockey we are extremely serious about the welfare of all players. Our camps have been designed by people with significant experience in coaching youth, club and school hockey. Chris Bowen, who designed and oversees the EVO camps program, has previously been Head of Hockey at Epsom College, Head of Hockey Development at Whitgift School and is currently Performance Director of Hockey at Reigate Grammar School. With EVO, you can be confident that your young players are under the supervision of top coaches who have experience in working with children, the required enhanced DBS checks and appropriate first aid training. + WHAT EQUIPMENT DO GOALKEEPERS NEED TO BRING? For goalkeepers, it is essential to bring a FULL goalkeeper kit to the camp, as we only have a very limited amount of equipment available at EVO. If your child doesn't own a kit but plays for a club or school, we recommend you ask them for use of their equipment during our camps. However, please check any borrowed kit to ensure you have a complete set. If you are unable to source a kit, please contact us. + WHAT HAPPENS ON A TYPICAL CAMP DAY? Camp days begin with registration, which is usually at 10.30am, unless otherwise indicated on the camp event page. At 11am, the camp officially opens. Players are welcomed, introduced to their coaches, we run through the format of the day and a few health and safety aspects. Then we head to the turf! Out on the turf, goalkeepers spend the majority of each day working with their specialist goalkeeping coach(es). Goalkeeper camps run alongside our outfielder camps. This means that, in addition to working within the goalkeeper specialist camp, goalkeepers will have the opportunity to face goalscoring situations, shootouts etc against outfield players as part of their training. This has the advantage that goalkeepers can work with their specialist coach(es), put this into practice immediately, and then return to the goalkeeper camp to reflect, evaluate and perfect skills. Goalkeepers are encouraged to ask their specialist coach(es) questions and get to know them - specially if they want to learn what the life and training of an elite athlete is like! There is no 'typical' camp day, but across a goalkeeper camp players will be coached in areas including footwork and leg movement, hand and stick movement, diving and floor movement, decision-making and reflexes, plus set play scenarios (penalty shootouts, 2v1s etc). There will also be Q&As and, of course, matches - where you can put what you learned into practice! Each day is broken up with drinks / snack breaks and lunch - make sure to pack these for your players! Camp days finish at 5pm and we often give out prizes on the last day. + ARE ALL CAMPS / CAMP DAYS THE SAME? No! Within each camp, every day has different coaching themes we work on with the players. Camps are structured so that skills learnt in previous days are progressively built upon throughout the camps. Due to the international nature of our coaches, we often have coaches flying in for 1 or 2 days of camp, with different coaching lineups each day. No two EVO camps are ever the same! We have a coaching team of over 100 different international players, from more than 20 different countries. So at each EVO event you will have different coaches, from different hockey backgrounds, bringing a host of new and different ideas! + I CAN'T BRING MY CHILD FOR EVERY CAMP DAY, IS THAT OK? Yes it is! With EVO camps you can book onto all, some or even just one day. Our camp program is progressive, with each day building on the last. Booking onto the full camp is therefore highly recommended where possible, in order to gain the maximum benefit. However, we know that young players (and you, the parents!) have busy lives, so each day has also been designed to work as a stand-alone day, regardless of your player's level. 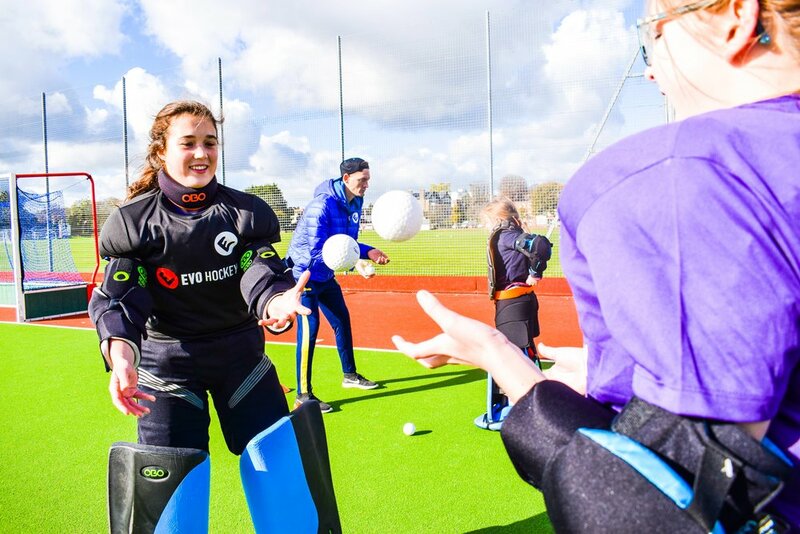 Just bear in mind that our international hockey players and coaches attending the camp can vary from day to day, due to their training and playing commitments. + WHAT IF WE HAVE TO CANCEL OUR PLACE? Although we cannot offer refunds, we can sometimes defer your place to a future date. Please make any requests to defer before your camp by email - no-shows cannot be rescheduled after the event. We cannot always defer your place, but we will try to help wherever we can! See our Cancellations & Returns policy for more information. + WHAT IF THE WEATHER IS BAD? This is the UK and we are made of strong stuff! We play on all-weather pitches, so expect the camp to run, rain or shine! Please ensure your children have sufficient clothing for the vagiaries of the British weather! Fear not, however. If the weather gets too bad, most of our venues have some indoor space that we can use for cover if needed. The only thing that can scupper us is if the pitches are unplayable, because they are frozen. Therefore, for camps in December and February, we operate an Adverse Weather Policy, which sets out what will happen in the event of bad conditions, when any decisions will be made, how they will be communicated to you and what will happen to any bookings. + LOVE THE EVO SHIRTS IN THE PHOTOS & VIDEOS! HOW DO WE GET ONE? You are in luck! Every NEW player registering on an EVO Hockey camp gets an EVO training shirt FOR FREE! Train with it on camp, get it signed by the stars, wear it to your club / school events and bring it back to wear on future EVO days. Returning players, please bring your EVO shirt back with you to wear on the camp. It's your training gear and will make you look awesome :) If you need new training shirts, you can purchase them in our Shop. + DO YOU PROVIDE LUNCH & / OR REFRESHMENTS? No. Please provide a packed lunch and drinks / refreshment for the day. This camp is open to all and run by EVO Hockey with the support of our location partners, Barnes Hockey Club & Richmond Hockey Club. Their provision of fantastic sports facilities enables us to bring EVO Hockey to the London and Middlesex regions.